Place a large soup pot over medium heat; add oil and butter. Once the butter melts and begins to sizzle, add the onion and cook, stirring occasionally, until the onion has completely softened, and the edges have begun to brown, about 10 to 12 minutes. Add the poblano chiles, stir and let them cook for 3 to 4 minutes. Make some room in the middle of the pot, and add the corn, sprinkle the salt and pepper and cook for another 3 to 4 minutes. Pour in the chicken broth, let it come to a simmer and cook for 5 more minutes, so that the flavors have had the chance to really blend. Reduce the heat to low, wait for about a minute, and gently pour in the milk. Heat the soup through, for about 6 to 8 minutes, and serve. If you make it ahead of time, and want to reheat it, do so over low-medium heat. Just made the soup. I’ve had a copy for 2 yrs and decided to make it. It is GREAT. I shared with my neighbors. This recipe is a keeper. I love watching and recording your shows. If you come to San Antonio will make sure I save money to see you. Thanks for opening your home to us. Happy to hear it is a keeper, Rachel 😄And I’ll try to come to San Antonio soon. -what if I don’t want to use milk? Does the flavor change if plant based milk is used? Go for it! También puedes hacer la sopa sin la leche y solamente usar más caldo. Hahaha yes it is nice when that happens. I’m glad you enjoyed it Joan! I consider myself a very good cook and was raised Italian. I have recently married a second generation Mexican and although I like Mexican food, had no idea how or even what to cook for him. This soup is one of his favorites and my suegra asks me to make it for family dinners. Thanks for the recipe. Its simple and delicious. That’s amazing! So happy the whole family loves it. It’s been a while since I’ve made this soup so I made sure to stop by the local Mexican market to pick up some fresh poblano peppers. I can’t wait to fire up the grill tomorrow and put it all together. This is probably one of my favorite recipes that I learned about through your show. So simple yet so delicious! Thank you, Pati! What a lovely comment…thank you so much Jeff! My husband and I loved this soup.I left toooo many seeds in the peppers,but it was okay.I didn,t have to add hot sauce. So happy to hear that Rose! I’ll let you know how it came out! I watched your show every Saturday and I enjoyed it I can’t stop watching it I enjoy the receipts and I’m finally going to try cooking one of your dishes. 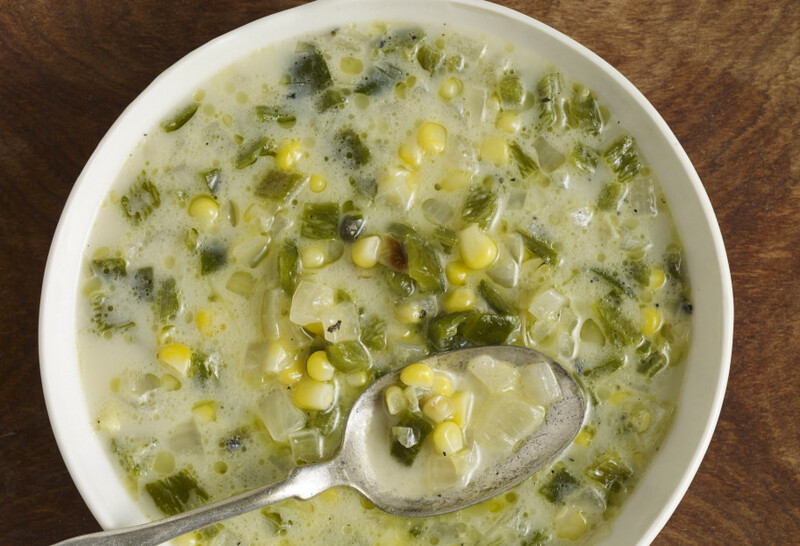 This is the simplest and tastiest soup. Even my daughter, who is not a fan of spicy foods, loves this soup. Yay! I am so happy to read this, Joy!